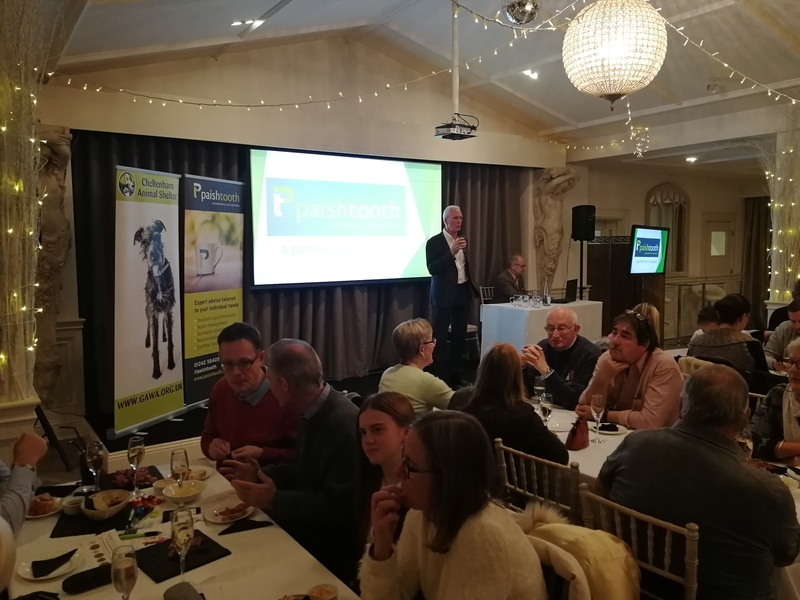 A selection of the finest business brains and charity lovers gathered at Manor By The Lake recently for the Cheltenham Animal Shelter Quiz Night supported by Paish Tooth. As well as 6 rounds of tricky teasers on subjects including geography and literature the evening contained an entertaining game of “heads and tails”, which through rare luck was not won by anyone resulting in prize money going back to the charity! With coin cards to be completed and “double point jokers” for sale there was lots of opportunity for people to dig deep, and the result was a fundraising evening that exceeded all expectation. “We were hoping to sell 100 tickets and raise a few hundred more on the night, so to have so many people in the room being so generous was amazing for us” said Shelter fundraiser James Clay, “thanks to the generosity of Paish Tooth covering all the costs for the evening, every penny raised will be going to support our work and provide care and comfort for the animals spending winter in the Shelter”. Paish Tooth’s director John Tooth, said “It was fantastic to see so many people turn out to show their support – it was a really fun night and we’re thrilled to have raised so much money for such a great cause. Thank you to everyone who took part. We have have been supporting Cheltenham Animal Shelter through a variety of fundraising efforts this year, which will culminate with a sale of mince pies and mulled wine at the Shelter’s Festive Evening on 1 December, and we’re looking forward to announcing the total raised for the year around Christmas”. The Shelter are now looking for sponsors for next year’s event, so if your company would like to be involved please contact James at fundraising@gawa.org.uk or 01242 548775.